Come alone or with a partner! Apprehensive? No need! Duplicate bridge is fun. Take a look at this Max Chauvet introduction to bridge video. 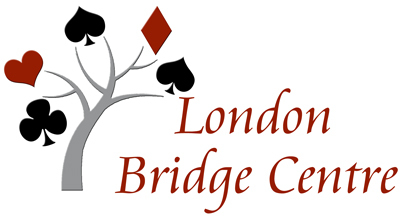 London Bridge Centre hosts two sessions of Supervised Play / Bridge Labs each week. These sessions, directed by Peter Tuttle, Marie Wiley, Judi Carter and others, offer you the opportunity to experience duplicate bridge by using bidding boxes and duplicate boards. These sessions are designed for students and beginning players to practise their newly acquired skills. There will be a teacher available to answer your questions on bidding and/or play of the hand. There will be no scoring. Fee for each session is $5 for members. At our Bridge Lab sessions, you will play hands that have been previously played in duplicate games, so you can compare your results to those achieved by other players. In this game you remain at the same table, which plays at its own comfortable pace, and scores are not recorded. Experienced players are available to give advice on bidding and play. Put those lessons into action! $7 for members. Please plan to arrive 10 minutes early so we can get underway on time. We start with a brief 1-hand lesson. Beginning Tuesday, March 19th at 1:00 p.m., London Bridge Centre will try a weekly duplicate game for players with fewer than 20 ACBL masterpoints. You do not need to be an ACBL member to participate. Our recent survey confirmed that there are several LBC members, with fewer than 20 masterpoints, who are interested in playing more frequently. The game will be held in the Teaching Room while Bridge Lab runs concurrently in the main room at LBC. Audrey Craig will direct the 0 - 20 game, while Peter Tuttle will continue to lead Bridge Lab. You will learn to use the BridgeMates for scoring. Following the game, the hand records and game records will be posted on the LBC website through Pianola. The first few weeks will be a learning experience without masterpoints as players get comfortable with duplicate movements and scoring. If enough players participate to warrant continuing the game, we will apply for an ACBL sanction so that masterpoints could be awarded in future games. If you have been enjoying Bridge Lab or Practice and Play and wondering if you are ready to give duplicate bridge a try, this is your opportunity! Game fees will be the same as Bridge Lab, $7 for LBC members and $9 for others. The sessions will finish at approximately 3:45. Please come out and join us and see why so many of us are hooked on duplicate! Come alone or with a partner. Bring as many of your bridge-playing friends as possible. The more the merrier for duplicate. If you don't have a partner, please arrive by 12:40 so we can arrange partnerships. When you are ready to try a "real" duplicate bridge game, here's where to start! London Bridge Centre hosts duplicate games for newer players in the 0 to 50 masterpoint game, directed by Audrey Craig on Thursdays at 1:00. These are excellent opportunities to meet other bridge players new to bridge and to gain experience with duplicate scoring, moving to other tables, Bridgemates and even our Pianola software. Don't miss out on all that the London Bridge Centre has to offer. Come join us on Thursdays at 1:00 pm.